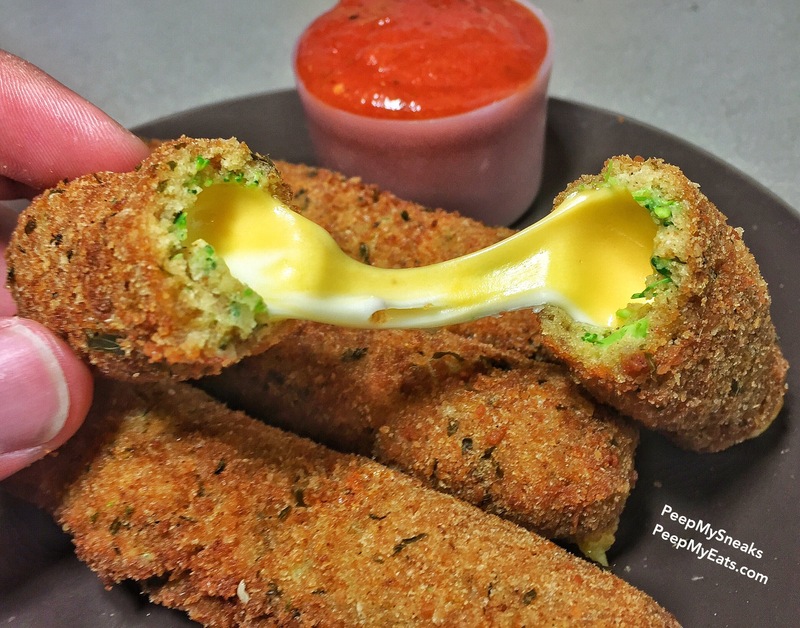 Today I’ll be showing you how to make Broccoli Cheddar Cheese Sticks! They’re quick, simple n delicious! This is as healthy as it’s going to ever get when it comes to recipes on this site so I hope you enjoy! Next you need to finely chop your broccoli (leave out the stems of the broccoli as much as possible) it’s easier to just use the tops as it sticks better to the cheese. Roll your cheese stick in your chopped broccoli. At first it will be hard to get it to stick together but make sure to spread evenly and don’t pack on too thick. Toss in a bowl of season breadcrumbs (should be able to mold easier now) if not repeat egg wash and roll in bread crumbs again. Deep fry for 3-5 minutes at 325° or until cheese starts oozing out. Combine with marinara dipping sauce or ranch and enjoy! Please make sure to subscribe & also follow on Instagram (PeepMySneaks) for more amazing eats! Hope you enjoy! Next postCookies n’ Creme Red Velvet Cookies! I love that this is as healthy as it is going to get here! Looks yummy!